Raw materials:	calcite, chalk, limestone, dolomite, kaolin, gypsum, and talc etc, totally more than 100 kinds of materials. 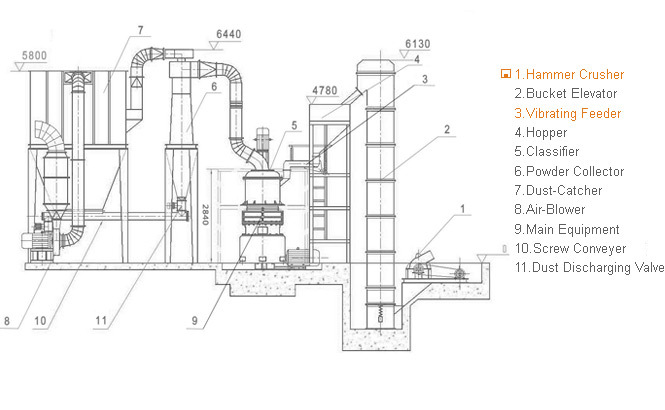 Barite Powder Production Line also is named Barite mill, Barite grinding machine,Barite grinding plant, is suitable for grinding Barite into fine powder. Barite Powder Production Line is the new type mining equipment for making micro powders, fine powders，which is widely applied in the industries of metallurgy, mining, chemistry, cement, construction, refractory materials, ceramics, and so on.The purpose of the micro powder grinding millis for super-fine grinding materials with hardness less than 9 in Moh's scale and humidity less than 6 percent such as kaolin, limestone, calcite, marble, talcum, barite, gypsum, dolomite, bentonite mud, mica, pyrophyllite, sepiolite, carbon black, diatomite, graphite, alunite, fluorite, potassium feldspar, phosphorite, pigment, up to 200 kinds. Barite Powder Production Line Production line: consists of hammer crusher, bucket elevator, storage hopper, vibrating feeder, main unit, inverter classifier, cyclone collector, pulse deduster system, high pressure positive blower, air compressors and electrical control systems. HGM series Barite Powder Production Line mainly consist of main unit, classifier, powder collector, dust cleaner, blower, muffler, sound-proof room, crusher, bucket elevator, storage hopper, and vibrating feeder. Under the same finished final size and the same motor power, the capacity of barite grinding mill is twice as much as jet mill, mixing grinder and ball mill, and energy consumption decreased 30%. please leave messages in our website, email me or leave me your contact details and tell me details you want, I will get back to you within one business day, thank you!